In the last decade, a substantial reduction in mortality from breast cancer has been reported across the Western world. As a result, many hundreds of thousands of lives have been saved. However, the mortality reduction materializes only when diagnostic and systemic therapies are delivered in a timely, evidence-based manner. The incremental steps toward improving breast cancer mortality involve multiple research initiatives, a great deal of funding, invaluable assistance from a large number of patients who participated in the original randomized controlled trials, and the incorporation of research findings into practice guidelines. The changes in breast cancer management responsible for improved outcomes started in the 1970s, with the approval of systemic treatments following primary surgery, including adjuvant CMF chemotherapy and the hormone tamoxifen. This was followed by improved chemotherapy regimens including anthracyclines, then taxanes and aromatase inhibitors and, most recently, biologicals. Researchers have attempted to quantify the contribution each of these developments has made to mortality reduction (see Figure 1). 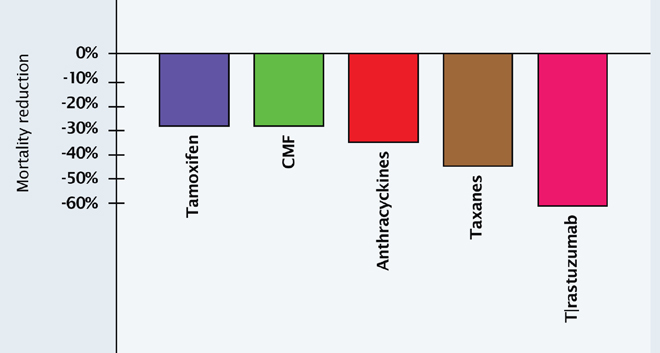 The antiestrogen tamoxifen brings an almost 30% mortality reduction if it is used consistently (Oxford-based Early Breast Cancer Trialists’ Collaborative Group). Chemotherapy brings an additional 28% mortality reduction, independent of hormones. Radiation offers a similar additional reduction in mortality. Screening mammography and education, which lead to early diagnosis and earlier use of therapies, plays an important role in mortality reduction, contributing around an additional 25% to 30% mortality reduction. Along with this progress, we are now witnessing the emergence of tumour biology research, where the genes responsible for specific types of tumour growth are identified, thereby enabling the development of monoclonal antibodies to inactivate a particular gene. In breast cancer, identification of the human epidermal growth factor receptor (HER2) gene enabled the production of Herceptin® (trastuzumab), a monoclonal antibody against HER2. The magnitude of benefit that emerged with Herceptin in the adjuvant setting was unexpected and will probably contribute another level of mortality reduction from breast cancer. What we saw in Canada between 1980 and 1990 was a significant variation in the adoption and use of these contributors to mortality reduction. Clinical practice guidelines are the mechanism through which best care becomes available to patients. 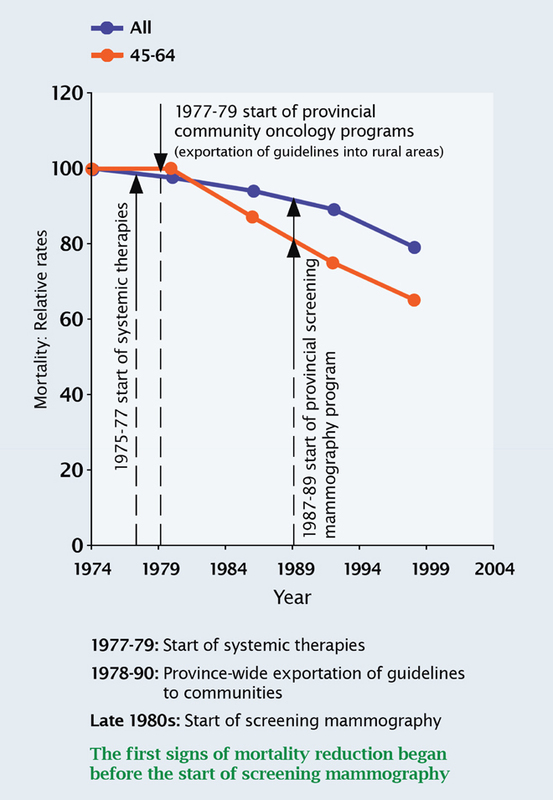 Figure 2 shows that in British Columbia, mortality began to fall significantly once guidelines for the use of systemic therapies were implemented throughout the province. There are significant variations in the adoption of clinical guidelines both within and between provinces. These variations have an important impact on mortality reduction in breast cancer. Historically, guidelines have been more readily adopted in urban than rural areas. Breast cancer mortality has been observed to be over twice as high in rural areas because of this failure to incorporate practice guidelines. (Hébert-Croteau, CMAJ 1999;161:951-5). Source: Ragaz J, Spinelli J et al., 2005, J Clin Oncol, Vol 23:40. 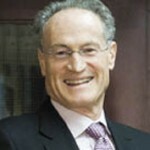 The University of British Columbia is now working with Health Canada to assess mortality outcomes according to the level of access to cancer therapies in different provinces between the years 1980 and 1990. Level 1 provinces (e.g. British Columbia) had the most uniform care with little difference between urban and rural regions (due primarily to an effective community oncology program); level 2 provinces (e.g. Ontario) had some variation between rural and urban setting; and level 3 provinces (e.g. the Atlantic provinces) had the least uniform standard of care. British Columbia stands out for a number of reasons. The community Oncology Program, begun in the 1970s, sees oncologists providing regular cover for most regional rural areas. Oncology hubs with local GPs and nurses were established across the province to help provide cancer care according to guidelines established by the Vancouver-based BC Cancer Agency (BCCA). There is therefore a long-standing commitment to a single standard of care for residents of the province. Equally important, British Columbia is the only province in which the entire budget for cancer care is coordinated by a single cancer care agency, the BCCA. 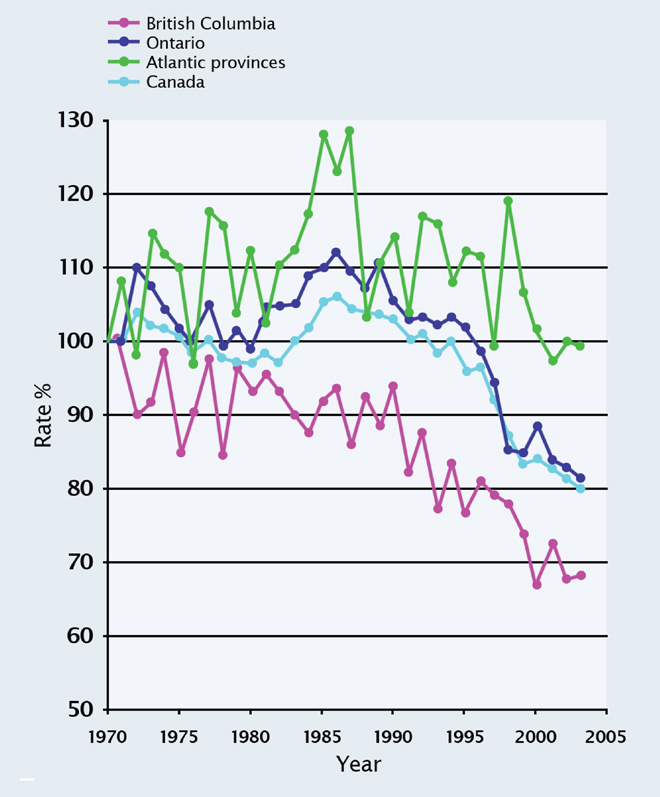 Figure 3 presents long-term breast cancer mortality from 1970 to 2004, comparing British Columbia, Ontario and Atlantic provinces. Results are plotted relative to the year 1970, for which age-standardized mortality rates are expressed as 100%. In British Columbia, a profound mortality reduction was already becoming apparent in the 1980s, soon after systemic therapies became available. In contrast, the mortality reduction for Ontario, and for Canada as a whole, only became evident much later between 1990 and 2000. In the Atlantic provinces, the mortality reduction only started to catch up in about 2007. The outcome differences between British Columbia, Ontario and the Atlantic provinces are in line with their levels of uniformity of cancer-care, and reflect variable access to guideline-recommended therapies. In addition to mortality outcome differences, poor access to optimum care in breast cancer means also more mastectomies, more advanced tumours and the need for more chemotherapy. In cancer and a number of other diseases, advanced diagnostics, genetic tests and pharmaceuticals have become critical and interdependent components of care. Delays in the approval (a federal responsibility) and reimbursement (a provincial responsibility) of new tests and drugs present challenges to accessibility and have important consequences on the health outcomes and lives of Canadians. As we now enter an era where genetics and the molecular classification of human diseases open up a whole new range of prevention and treatment strategies, the impact of delays risks creating even sharper differences in outcomes between those who have access to up-to-date tests and treatment and those who do not. Delays in the implementation of optimum cancer care cost money and lives, and contravene the accessibility principle of the Canada Health Act (CHA). Thus, when looked at through the lens of cancer care, we can see that in order to uphold the principles of the CHA, we need to ensure that advances in care are applied quickly and evenly in every part of the country.